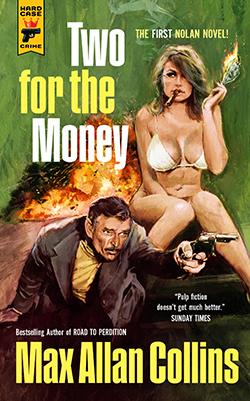 TWO FOR THE MONEY includes two complete novels that tell a single epic story — published for the first time in a single volume. Noir Originals on Max Allan Collins’ Nolan series: "I’ve loved every single Nolan book...finding Nolan [is] like discovering a new kind of drug." "No one can twist you through a maze with as much intensity and suspense as Max Allan Collins." "One of the new masters of the genre." "Collins breaks out a really good one, knocking over the hard-boiled competition (Parker and Leonard for sure, maybe even Puzo)...the book is unputdownable. Never done better."